Ref: The great war for New Zealand, Waikato 1800-2000, Bridget Williams Books, 2016, Vincent O'Malley, Auckland Libraries, 993.3 OMAL. 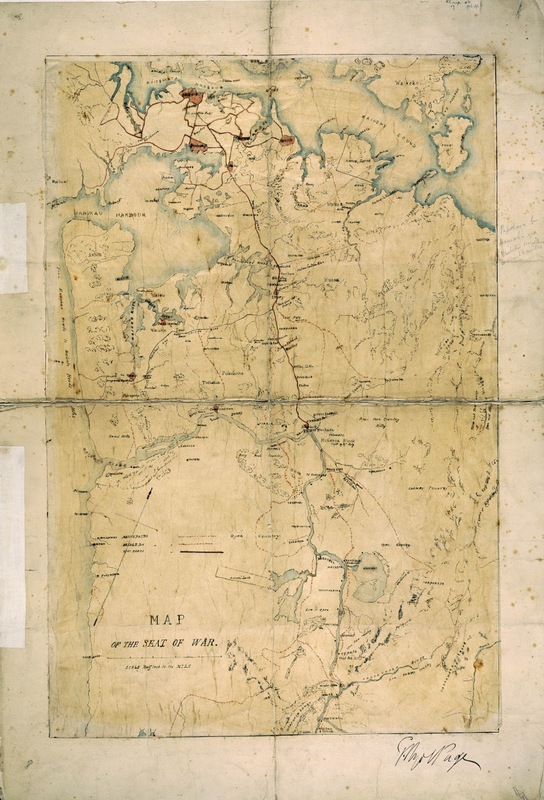 On 12 July 1863 British Imperial Army troops crossed the Mangatāwhiri River which marked the boundary between British occupied territory and land under the authority of the Kingitanga (the Māori King movement). The crossing of this boundary by military troops, just south of the city of Auckland, was a declaration of war. The invasion of the Waikato had begun. 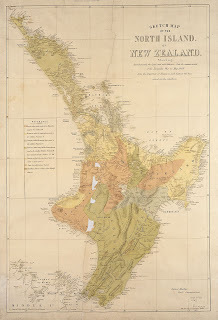 Ref: Sketch map of the North Island of New Zealand, shewing approximately the loyal and rebel districts, 1869, Sir George Grey Special Collections, Auckland Libraries, NZ Map 2563a. 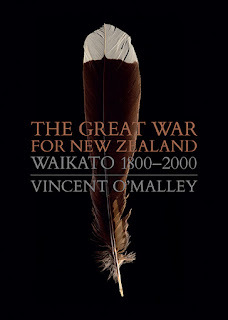 Vincent O’Malley’s latest work The great war for New Zealand: Waikato 1800-2000 provides a vast repository of research to support his view that the Waikato war, the epicentre of the New Zealand land wars, was the defining conflict in the history of Aotearoa New Zealand. He believes that the war had a greater impact on this country than the world wars of the twentieth century. O’Malley argues that the Waikato war was ultimately a battle by the Colonial government attempting to assert its power and supreme control over Māori, a conflict which resulted in Māori being marginalised in their own land. The author is a noted researcher and has published a number of books on Māori history. This book is based on the author’s research for the Waitangi Tribunal. Ref: Map of the seat of the war, 1860s, Sir George Grey Special Collections, Auckland Libraries, NZ Map 17. 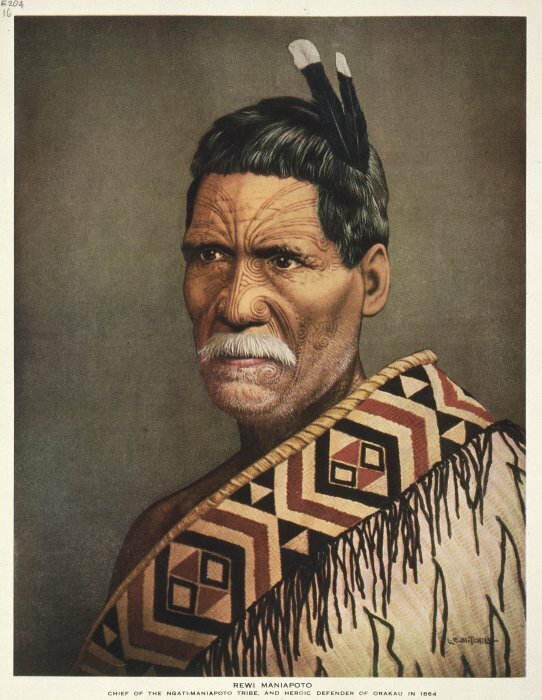 The great war for New Zealand is essentially the story of the Tainui people who trace their ancestry back to the arrival of the first Tainui waka in Aotearoa New Zealand. The author’s research contributes significantly to the increasing body of knowledge which provides alternative scripts to the official colonial government version of the history of the land wars. 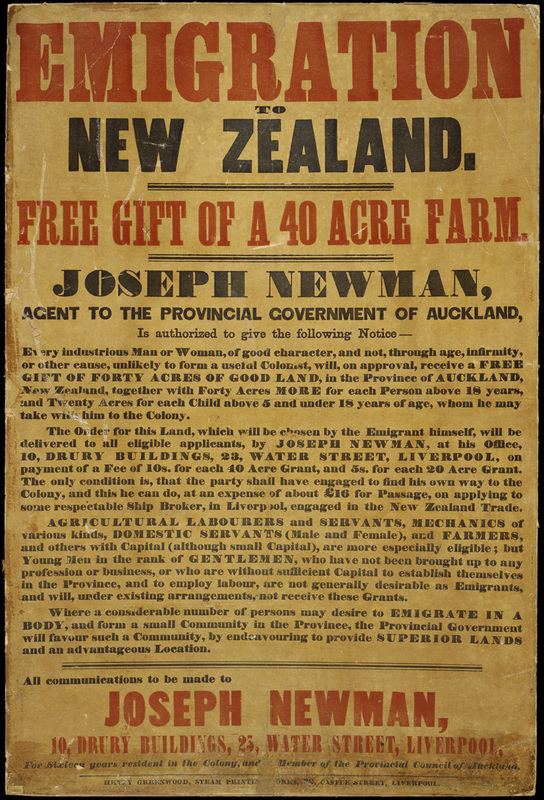 The colonial version dominated New Zealand history books for over 100 years and placed key responsibility for the war on Māori. The great war for New Zealand does not hesitate to ask the important questions which challenge the validity of accepted notions on, for example, the outcome of key battles such as Rangiriri and Ōrākau. Ref: Monkton, Charles Henry, 1840-1890. 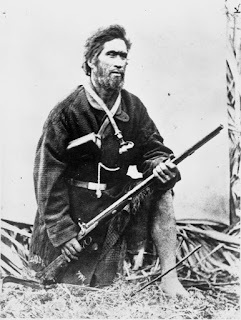 Wiremu Tamihana Tarapipipi Te Waharoa with a double barreled shot-gun - Photograph taken by C H Monkton. Ref: 1/2-005322-F. Alexander Turnbull Library, Wellington, New Zealand. O’Malley’s book frequently references other noted authors on the New Zealand wars including: James Cowan, whose first-hand accounts by both British Army and Māori veterans provide unique content (his father was a military settler and Cowan grew up on confiscated Māori land in Ōrākau); James Belich for his controversial re-interpretion of events which provided a strong Māori voice on the war, and John Eldon Gorst for his wealth of contemporary insights in his book on the Māori King. The book contains much original source material and includes extensive endnotes to corroborate the text. The comprehensive bibliography is, in itself, a work of art: a scarily vast repository of sources on the land wars. The many illustrations provide an alternative visual narrative of their own. 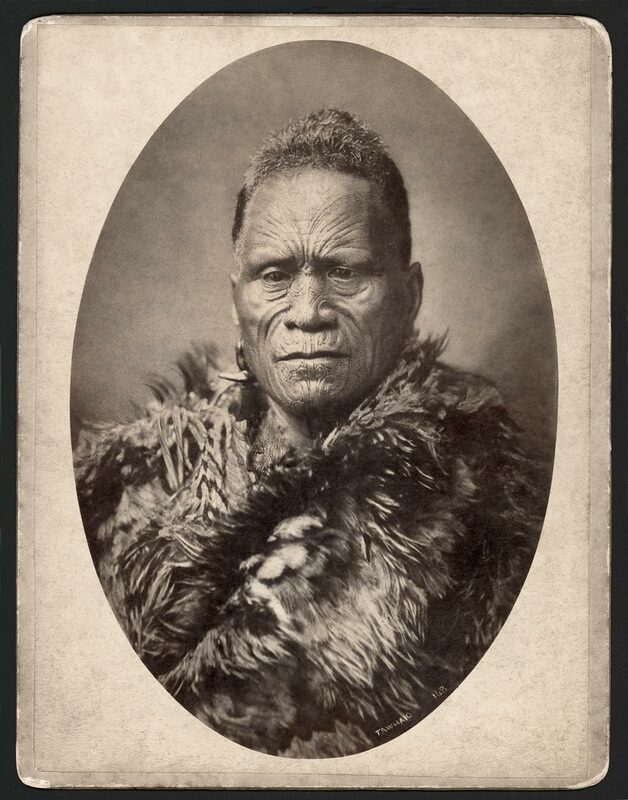 Of special interest are the evocative early photographs and Lindauer’s Maori portraits. 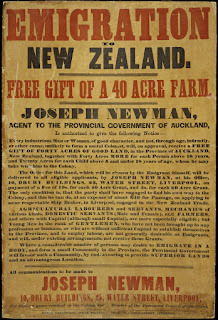 Ref: Henry Greenwood, Emigration to New Zealand, 1850s, Sir George Grey Special Collections, Auckland Libraries, 7-C2024. O’Malley provides an in-depth account of the conflict from the background of early, friendly relations between the British and Waikato Māori; the rapid increase in the European population; loss of Māori land; the establishment of the Kingitanga; the path to war and its bitter aftermath of raupatu. He outlines the many decades in the struggle for Māori to reclaim their lands through non-violent means such as the passive resistance strategies used at Parihaka. The author concludes with the signing of the Raupatu Claims Settlement Act of 1995. The act was signed into legislation by the Queen and included an apology to Tainui from the Crown for the invasion of the Waikato and the wrongful confiscation of their lands. Ref: Mitchell, Leonard Cornwall, 1901-1971. 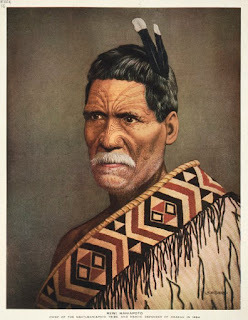 Mitchell, Leonard Cornwall 1901-1971 :Rewi Maniapoto, chief of the Ngati-Maniapoto tribe, and heroic defender of Orakau in 1864. [1930s or 1940s?]. Ref: E-204-q-016. Alexander Turnbull Library, Wellington, New Zealand. One of the author’s greatest strengths is his portrayal of the key protagonists: Governor George Grey, the Māori King Tawhiao, Rangatira Rewi Maniapoto and Wiremu Tamihana, and the British Commander General Duncan Cameron. O’Malley places most of the responsibility for the war directly on to Grey. He portrays the Governor as a ruthless ‘natural autocrat’ with a Machiavellian level of manipulation and power-mongering which is almost off the scale. Grey is depicted as both provoking and exaggerating the threat of an imminent Kingitanga attack on Auckland. 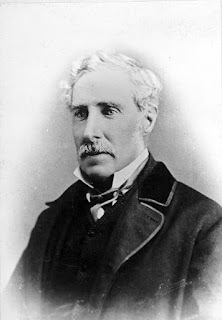 This ‘threat’ was then used to secure more troops, funding and artillery from the Colonial Office to pursue his own agenda of an invasion of the Waikato to crush the Kingitanga movement. At one stage there were more British Imperial Army troops stationed in this tiny colonial outpost than there were in the whole of the Indian subcontinent of the British Raj colonial era. From the moment Grey had arrived back in the country there was an overwhelming sense of inevitable slide into full scale war. The author claims that Grey and his government had a clear choice at many points to choose between peace or war. Māori wanted peace. Grey chose war. Images: Left: King Tawhiao, Sir George Grey Special Collections, Auckland Libraries, 258-1. Right: Hanna Studio, Portrait of Sir George Grey, Sir George Grey Special Collections, Auckland Libraries, 346-A13113. The Great War for New Zealand, Waikato 1800-2000 is a ground-breaking book which confirms Vincent O’Malley as not only one of our most authoritative research historians but also a great storyteller. This book is taonga.